Easy DIY home improvement projects might scare most individuals but our readers are constantly researching on the subject in the search of the incredible. Small little diy projects that are changing the ensemble all together with baby steps are the best things you can find thanks to their easy nature and inexpensive materials required in most cases. Below you will find a list of such projects curated for you with care. They are here to serve as inspiration, you can always enhance the result with simple changes and adapt the solutions to you home. Craft away! From time to time exposed slab foundation contributes to the overall design of the home but these cases are limited to several designs envisioned by architects and sadly most of the time the foundation stays exposed due to the high costs of rock, stone brick and wood. There is an option though. You can use faux rock, stone brick or even wood with different colors or textures to complement the exterior of your home. You can even use an accent wall or a fireplace/firepit in your backyard to complement it. 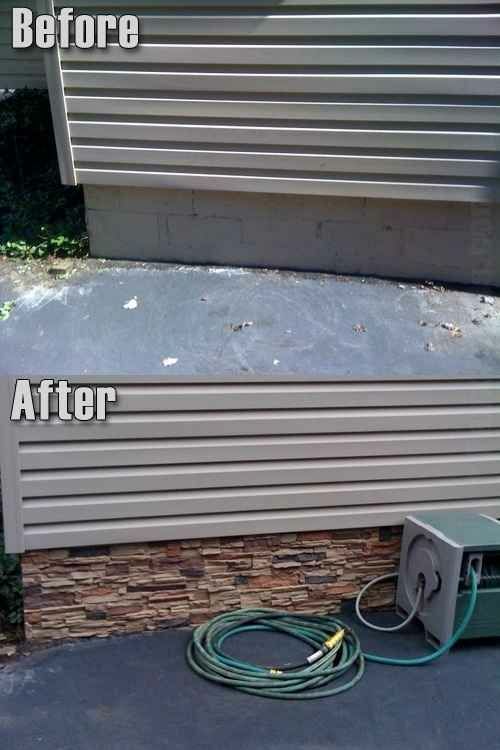 Just imagine how much better would your home look with a minor improvement. You should never let piping, electrical boxes or wires to ruin the aesthetics of your home. It is sad indeed to obtain that desired look after years of hard work and get it ruined by piping or wires in a few minutes. Do your best and make sure that these utilities are the same color as the home, this will make them less noticeable and painful to your eyes. 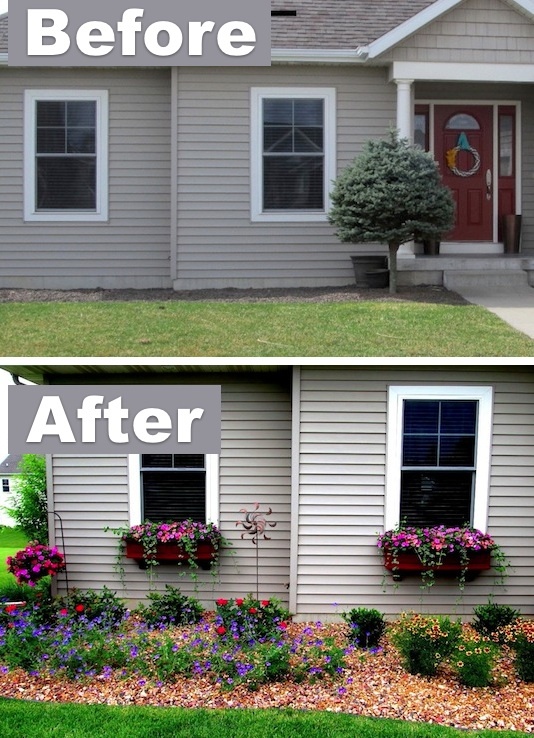 You can obviously paint multiple things in your yard the same color to enhance your entire home exterior decor. Replacing the main access door will make a huge difference in your design but if everything on your old door works fine you can consider upgrading it through paint and molding instead. Look underneath and we are sure that you`re going to be stunned by the huge difference. Simply extraordinary and inexpensive. Below the molding used was made out of foam but if you want to know that it will last forever you can go with wood. Forever seems like a chain though, change is good, embrace it . The trees in our yard are one of the most extraordinary things that we can enhance. They provide fresh air and shade beyond the obvious aesthetics. Make them even more useful by building a simple tree bench where your children can eat, you can eat or simple take a nap. You can use them to hold potted plants as well. This solution will also hide those bald spots in the lawn cause by the insufficiency at the base of the tree. Air conditioning is a must in most climates but the outdoor installation is definitely something not worth looking at. In certain urban areas is actually a violation to have it visible simply because it damages the view. The problem can be solved with ease though, a small little lattice fence can disguise it in a beautiful manner. If the air conditioning is positioned on the ground you can even wrap it in potted bushy plants. How graphic and pleasant would that be? Simple window boxes can transform a dull home in a small magical fairy tale cottage that will showcase the best plants of the season. Moreover, this will make the home windows look bigger and will provide fresh air in the morning at your grasp. In most cases the mailbox is the first thing that pedestrian observe about your home; sometimes is the first and the last contact between your home and the viewer. You can get creative and take the opportunity to showcase a little bit of personality in this small box. You can make it look like a sustainable catalog, showcasing recycled wine bottles or a car enthusiast individual that used a car piece to hold the little box. 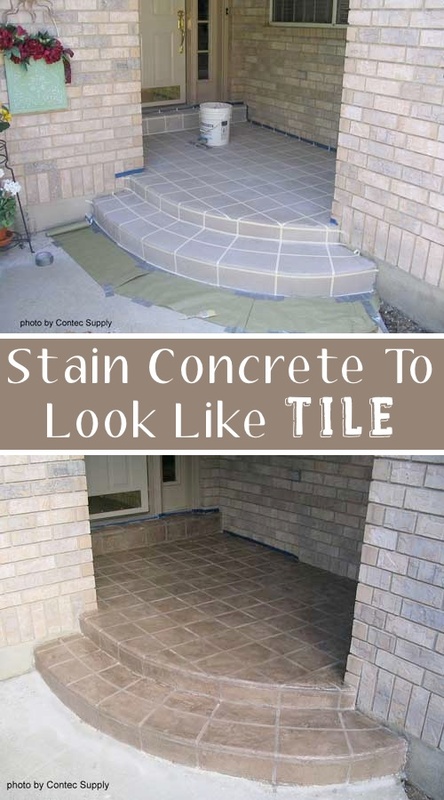 In most cases you will want to obtain the look that came straight through a luxury home catalog though; whatever is the case, go ahead and change this first impression to your advantage. A few pieces of stone can create a huge difference in a decor by making the entire scene more delicate and more inviting. Showcased below, a small portion of the backyard has been transformed with a few pieces of rock and some extra flowers. If you have small windows on a big facade and they lack composition equilibrium you can influence the aesthetics with shutters. You can brake monotony with a vintage looking design or a shabby chic colorful one. 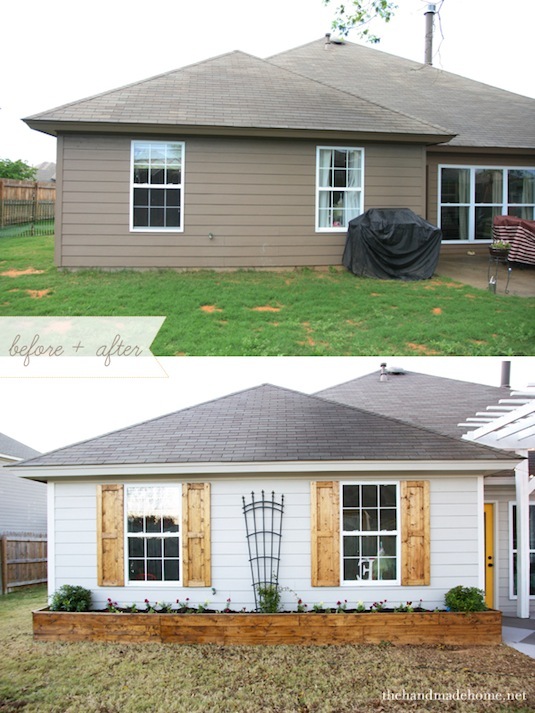 Along with planters by the windows your home will be transformed into a cottage with two simple upgrades. Make sure that you break monotony by creating a little contrast. By simply painting certain elements in your backyard or your interior decor you can transform bits and pieces and enhance the ensemble beautifully. Here some faux grout lines have been realized by painting the concrete. This small trick made the main access look a little more welcoming . 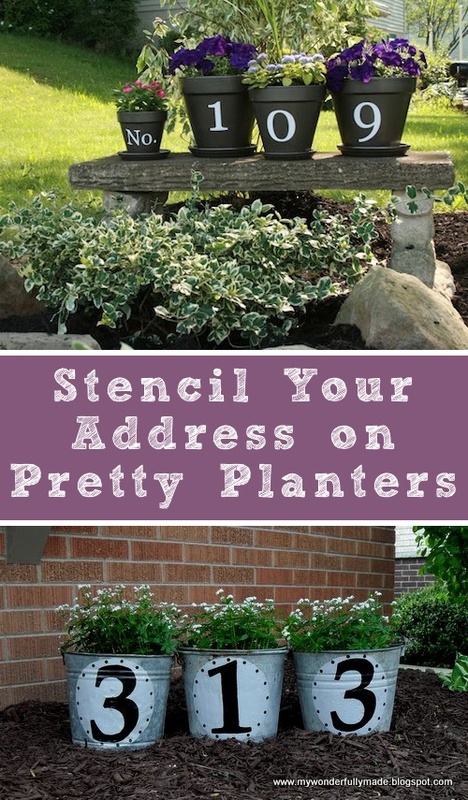 If you want a really original way to showcase your address number you can do it by painting or carving the numbers on planters. What can be more graphic and simpler at the same time?! This ideas has been discovered on Pinterest and in its simplicity it can be easily implemented with any kind of flower pots. A pergola will improve the graphic values of your home with greenery and wrap it with personality and character. If you choose vines the result becomes even better. They do require quite a bit of maintenance but is definitely worth it. While this might not be every one`s cup of tea there are hardware kits realized especially for this graphic improvement. 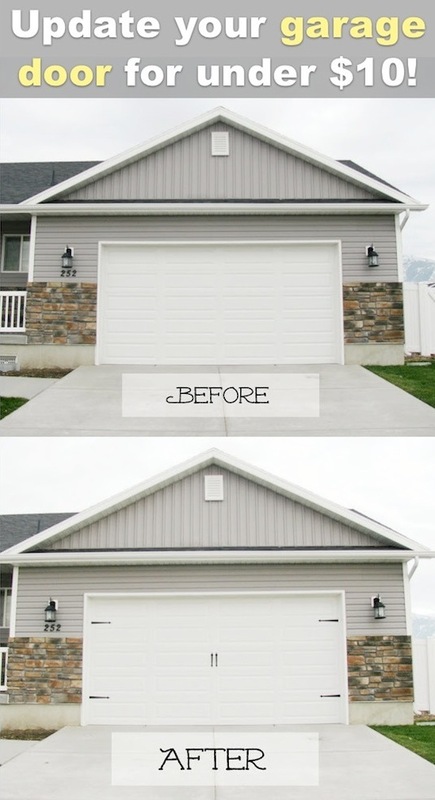 With a five minutes work and 10 dollars you can have the garage door accessorized with little metal elements that will differentiate it from other garage doors. Simple and quite efficient. 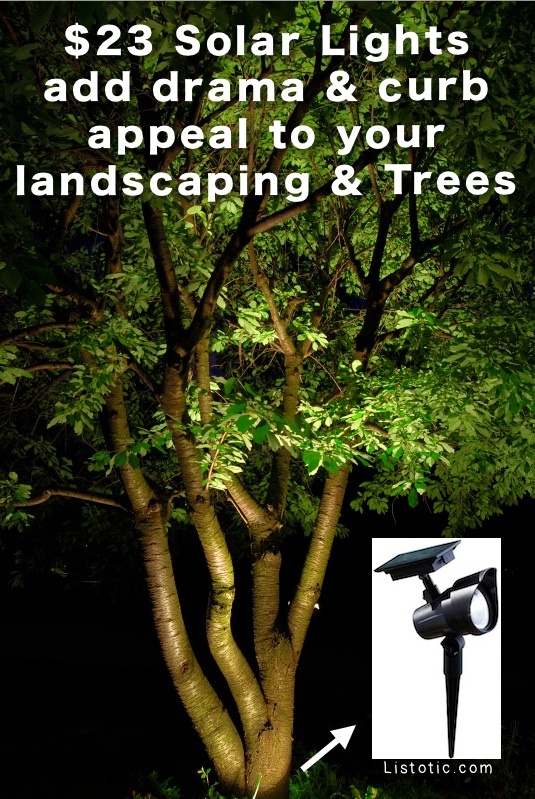 Tree and shrubs are greatly enhanced by light when the night settles, you can transform your backyard with a few solar powered spotlights. There are no wires attached, no extra expenses on your electrical bill and no hassle; all you have to do is to install them. Simple and efficient. If in your case these spotlights would fail to capture light you can find a few with solar panels attached through a long wire that would place the spotlights on a greater distance from the scenery, managing to capture enough sunlight during the day. Your hose can actually be hidden today in large recipients to preserve aesthetic values. You can take this idea and adapt it to your own backyard though by adapting an already owned recipient to accommodate your hose or create a hidden compartment under a bench. 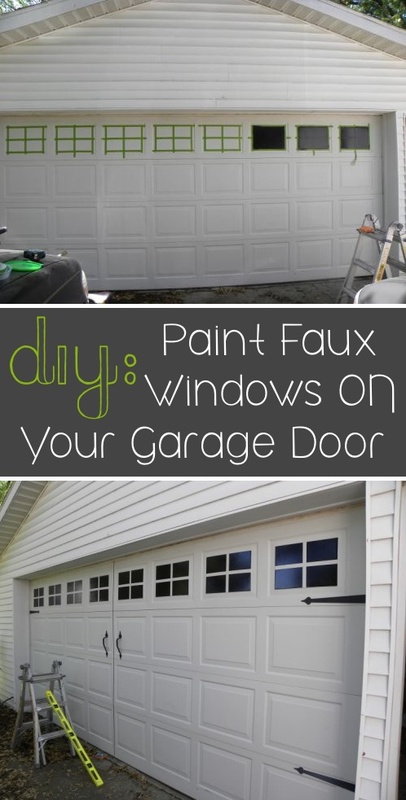 This move might change you garage door quite a bit. If you windows are not the model you are looking for you can always search a pattern or model that you`re quite fond of and materialize it on your garage door. Make a change.